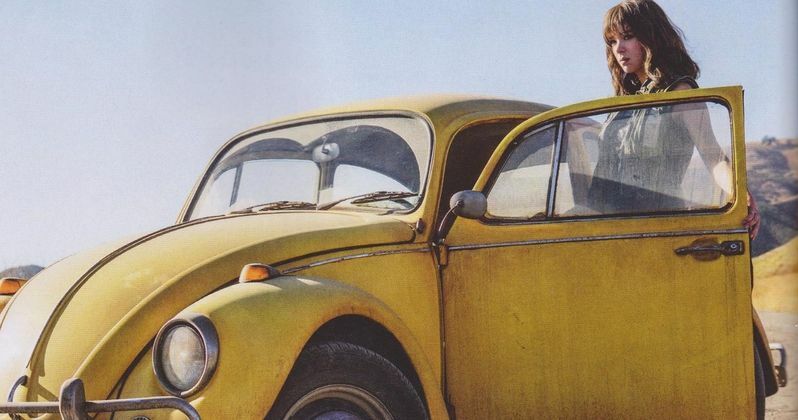 We're almost a year away from seeing the Bumblebee spin-off movie and we now have our first official image featuring a 1987 yellow VW Beetle alongside Hailee Steinfeld as the 18-year old Charlie Watson. Bumblebee is a beloved character from the Transformers franchise and the announcement of a standalone movie featuring the yellow bug was a welcome one. Transformers on the big screen has been a mixed bag to say the least with the most recent movie, The Last Knight, getting torn apart by fans and critics. Bumblebee: The Movie looks to go back to the franchise's roots to remind people why they fell in love with the Transformers in the first place. The new promotional image from the Bumblebee movie features Hailee Steinfeld's Charlie Watson character hanging with the 1987 version of Bumblebee on a dirt road. Steinfeld's Watson character is still in high school and is a mechanic who discovers Bumblebee. The actress has said that that the movie is very character driven when asked how it compares to the rest of the Transformers franchise and also mentioned that it takes place in the 1980s. When asked if her character was similar to Shia LaBeouf's in the first Transformers, she mentioned that only the loveable character of Bumblebee was similar. Charlie Watson is an 18-year old mechanic still in high school when she discovers Bumblebee. When asked about her role in the movie, Hailee Steinfeld had this to say. "I play a character named Charlie Watson, who is a mechanic. She's in high school... [She's] incredibly unique and strong and has - something I love about her is that a lot of people tend to underestimate her knowledge and she continuously proves herself and what she knows and creates this incredible relationship with this Transformer." Steinfeld also went on to say that she goes on to form a strong relationship with Bumblebee and that the Transformer is always there for her. The actress also called the VW Beetle a "gentle giant," which is true to what we have seen from the character throughout the last 30-plus years. Wrestler John Cena also has a role in the upcoming Bumblebee movie and says that the project is a "wonderful reboot" of the original Transformers franchise, which as previously noted is a welcome change. Cena is rumored to be playing an agent of the secret government operation Sector Seven, but that has not been confirmed as of this writing. The wrestler is pretty secretive about his role, but promises that there will be surprises while also mentioning that he took the role because it's different for him and it was a challenge, which could very well mean that he's playing a villain this time around. Bumblebee: The Movie hits theaters on December 21st, 2018 and fan expectations are pretty high for the project. The movie is directed by Travis Knight (Kubo and the Two Strings), and stars Hailee Steinfeld, Pamela Adlon, John Cena, Stephen Schneider, Jorge Lendeborg Jr., Jason Drucker, Kenneth Choi, Ricardo Hoyos, Abby Quinn, Rachel Crow, Grace Dzienny, and John Ortiz. This is one of the first official images we've seen showing off Bumblebee's new old alt mode, returning to the Volkswagen Beetle for the first time since the G1 cartoon. You can check out the new image below, courtesy of Comic Fade's Twitter account.